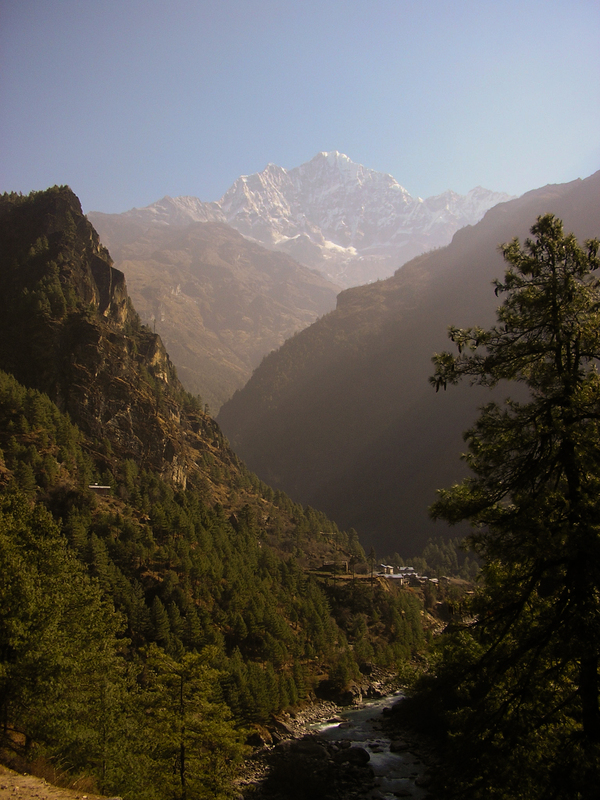 Next day to Namche. We start early, before the sun has found us, and we begin our walk in the shadow of Kwangde’s sheer granite east face as it stands out against a clear blue sky. 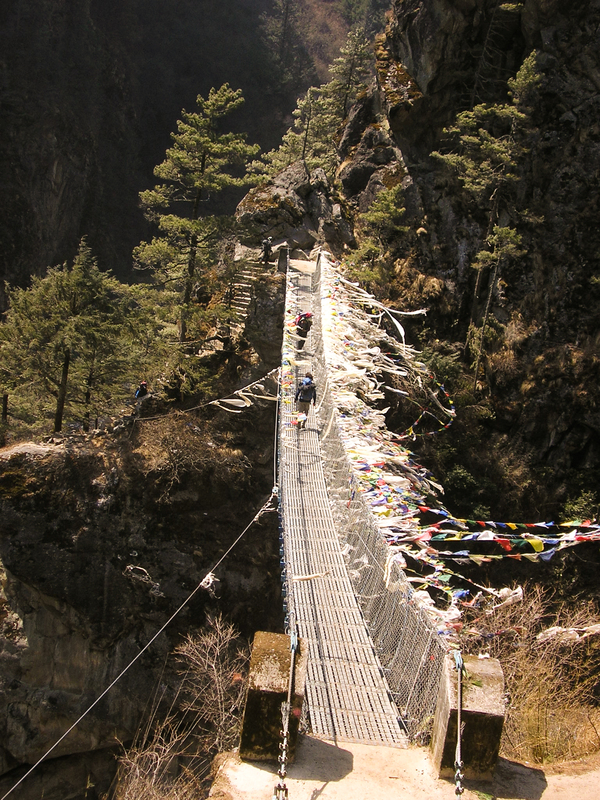 Just outside Phakding, we cross the first of the famous suspension bridges. Bouncing alarmingly some 100ft over the raging river, Sonam assures me that these lifelines come with a fifty-year guarantee from the engineers, and the engineers are men who are held in high esteem. Watching a big herd of dzopkyos (yak-cow hybrids) crossing the bridge, I can see why. 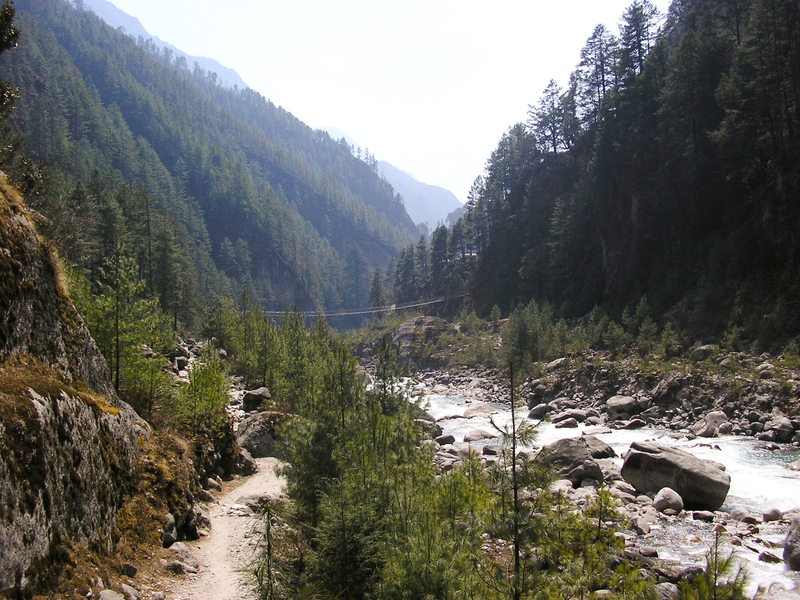 The track crosses and re-crosses the river quite a few times, as the river narrows into a gorge, through the villages of TocToc, Benkar and finally Chumoaa, where Sonam lives with his young wife Lakhpa, and tiny daughter Tenzing. Refreshed by a powerful bowl of Sherpa broth courtesy the lovely Lakhpa we cross a small bridge over the Chumoaa Khola that comes down from the silvery heights of Thamserku- the tower of gold- and stop for lunch at the Monjo Yeti Mountain Home, just before the entrance to the Sagarmatha National Park. Tuna sandwiches! In Monjo! I still couldn’t get used to the shock of such everyday luxuries. Just outside the village is the entry post of the National Park where you register yourself, and then across another suspension bridge to the tiny village of Jorsale or Thumbug where an army post checks your papers. This is one of the many times on this trip that I thank my lucky stars that I’m from a SAARC country, as we’re casually waved through without any real check. Apart from the fact that it costs me only NPR100 a day to be in the national park, there seems to be great goodwill in the fact that me and Puneet are Indians. And I can see why as a few days later when I come across an incredibly high and ambitious water pipeline project financed by the Indian government. Add to that the fact that we are the only Indians in all of Solu Khumbu, and no wonder we get wide disbelieving grins everywhere, often mistaken for Nepalis. Despite the joys of Visa-less travel and our currency actually being stronger (if only 1.6 times so), rarely do Indians- apart from army climbing expeditions- venture here for their holidays. 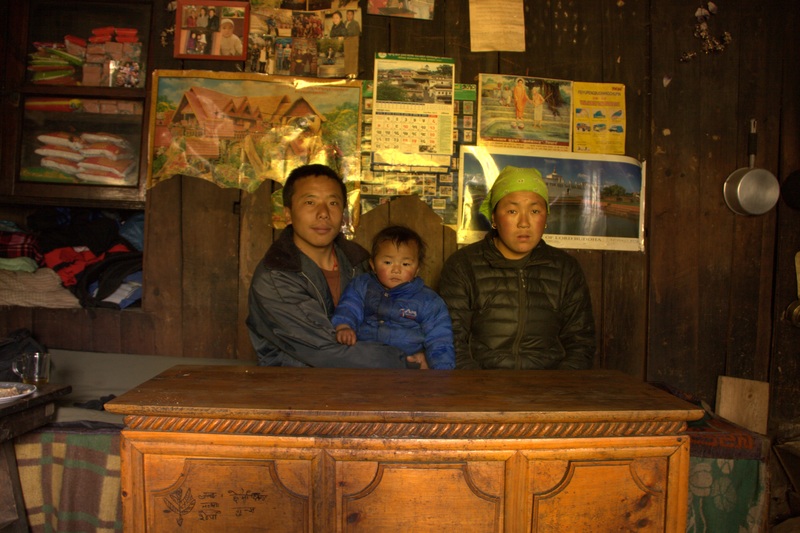 As a result, even Africans are considered less exotic than Indians in Khumbu, even if many generations of Sherpas have had close relations with Indians in havens like Darjeeling. Out of Jorsale, after a pleasant walk beside the river as it passed through a heavily forested gorge, we come to the most famous suspension bridge of them all- the Larja Dobhan bridge. Hanging precariously from one rock face to another rock face almost a kilometre above the junction of the Dudh and Bhote Kosi rivers, it’s a scary, windy place, especially when the bridge starts bouncing under the hurried stride of nervous tourists rushing to get to the other side. Huge numbers of kathas (blessed scarves) and prayer flags flutter in the breeze, despite the fifty-year guarantee, as spiritual, just in case. 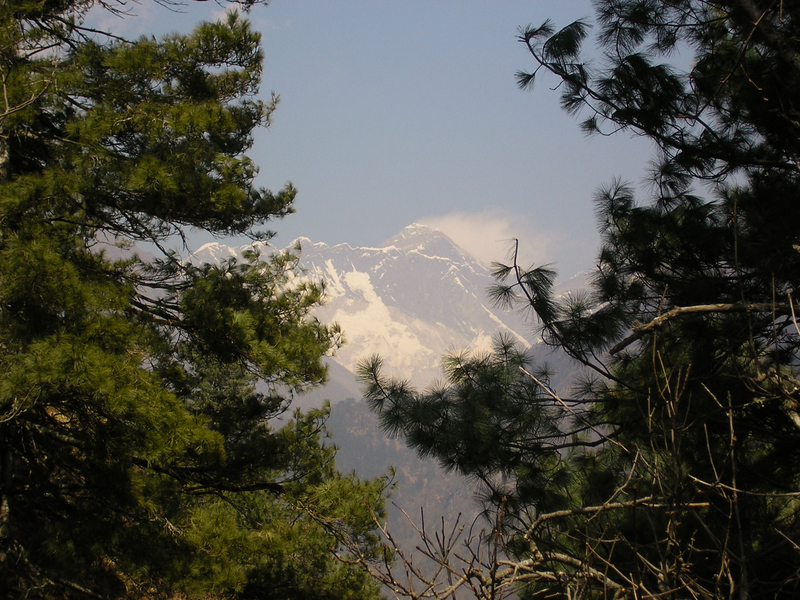 From here the track climbs a steep and dusty 1600ft through pine forests to Namche. As we climb over the deep gorge of the Bhote Kosi, Thamserku and Kusum Kankharu get bigger behind us, and in front, the three peaks of Kwangde. But the pride of place on this trail is reserved for the Big E, viewed through the pines on a little spur halfway up the climb. When we got there, a gaggle of British and Japanese pensioners were oohing and aahing at the sight of their lives while a no-nonsense Sherpani sold oranges at NPR 80 a piece. There was Everest, it’s black summit pyramid looking like glass in the harsh noonday sun, smoking behind the stupendous curtain of the Nuptse ridge, with Lhotse for company. It is quite a sight. Just below the crest I could see the Hillary Step, that famous rock outcrop which is the gateway to the summit ridge. In less than a month, it would be the site of major traffic jams as scores of would-be summiteers paid through their nose to be hauled up to the patch of snow and rock that was the highest point on earth. On May 23, 2010, 169 climbers reached the summit of Everest. An hour and some later we’re up in Namche, the horsehoe-shaped metropolis of the Sherpas, in the loving arms of the Yeti Mountain Home. Along with us are a Dutch couple who’ve been haring around the region for a while and a French group on their way to Gokyo. We have our customary round of the reviving hot lemonade and coffee and cookies in a wood panelled lounge that is a joy for mountain lovers. Full of books on Nepal’s mountains and surrounded by old pictures of the region, one could spend hours here. But we had the sunset to catch. So we rush to our room, this time blessed with bay windows overlooking Namche the towering Kwangde Ri (Ri means peaks) beyond. Another (hot) bath later, we head out to the view-point a short way above the lodge inside the headquarters of the Sagarmatha National Park. 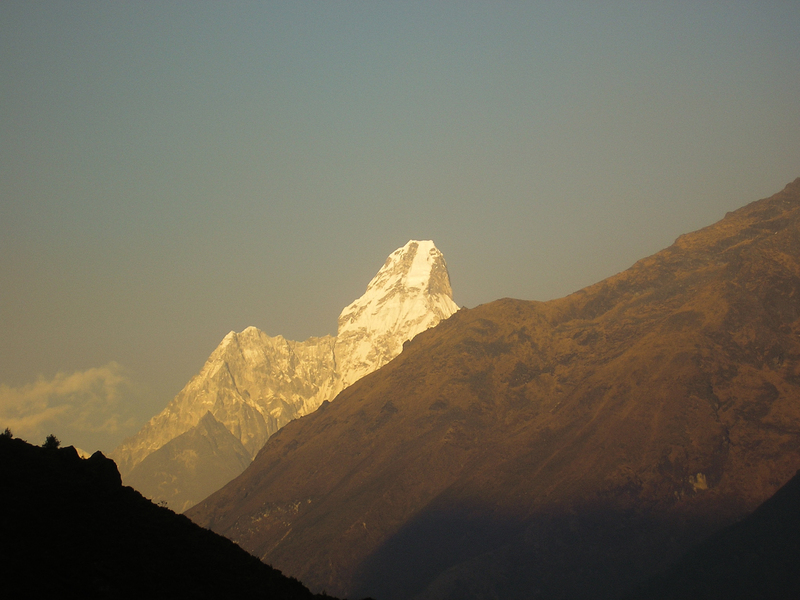 And here I see the mountain I’ve been longing to see the most- the eerie Ama Dablam. 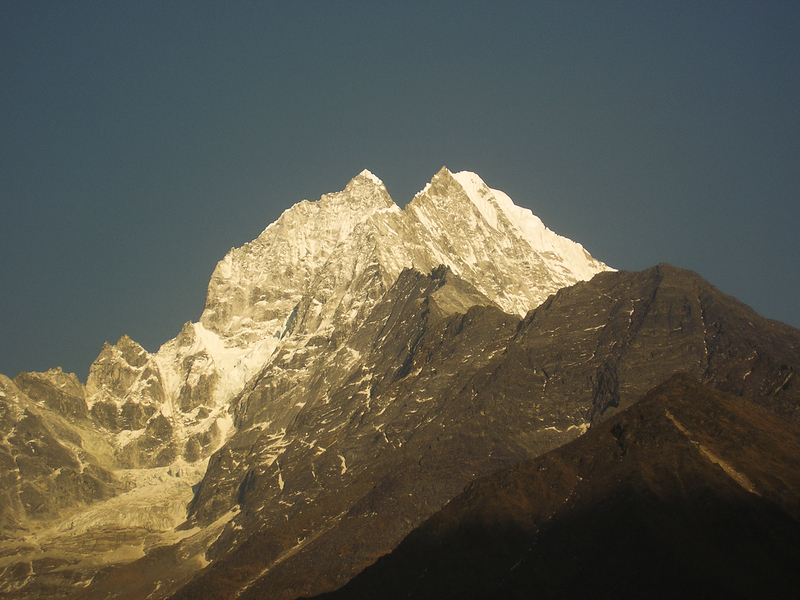 The classic South West view of the peak has to be one of the most beautiful and aesthetically pleasing mountain profiles in the world, alongside Matterhorn in the Alps and Changabhang in the Nanda Devi sanctuary. 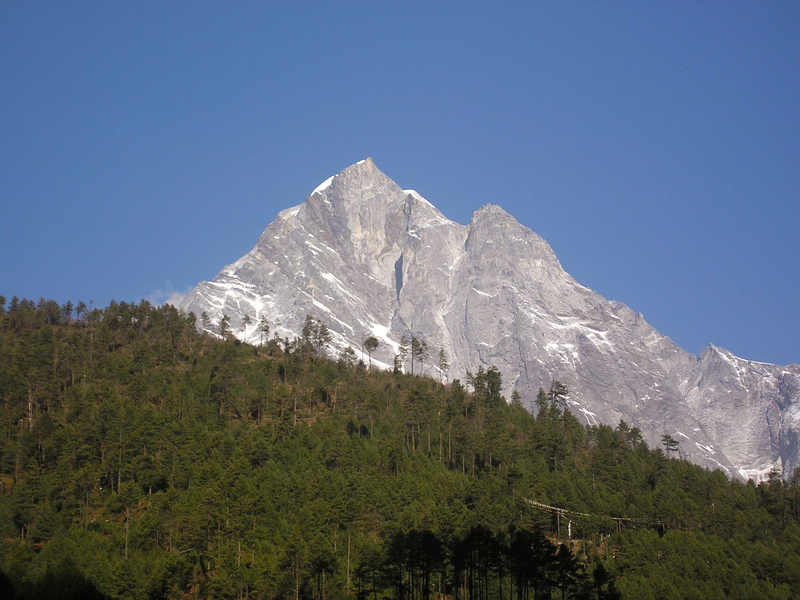 Although much lower than the Everest-Lhotse group at the head of the valley, Ama Dablam’s (which means ‘mother’s blessed pendant’) proximity to the viewer make it appear larger than life. It appears bathed in the soft orange glow of sunset, its famed hanging glaciers looking much like the congealed flourishes of an oil painting.